It is no secret that I enjoy the turn based strategy games. It is also no secret that the king of that ring is Shining Force. Being able to control massive amounts of characters while conquering challenging maps sticks with me to this day. The bright and colorful graphics set a standard that few games have come close to approaching in all the years since. 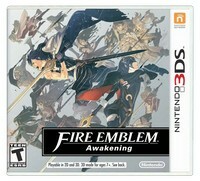 So what about Fire Emblem Awakening? Nintendo's recent Nintendo 3DS release? Does it meet the standards Shining Force set so long ago? I am working on this hand held title, and hope to be able to provide a comprehensive and full answer to that question in an upcoming issue of Family Friendly Gaming. Thus far Fire Emblem Awakening has been a disappointment. Starting with the $39.99 price tag - before massive taxation is added. The violence is something I expected in Fire Emblem Awakening. Why is there bad language and enticement to lust? Why is there a religious system set in place to move Christians away from God? And why does the ESRB ignore that last question? The story portions of Fire Emblem Awakening are long, boring, and drawn out. Most of the battles feel the same, and are equally as boring. If you need an answer today on this hand held video game, then I say save your money for a good game.